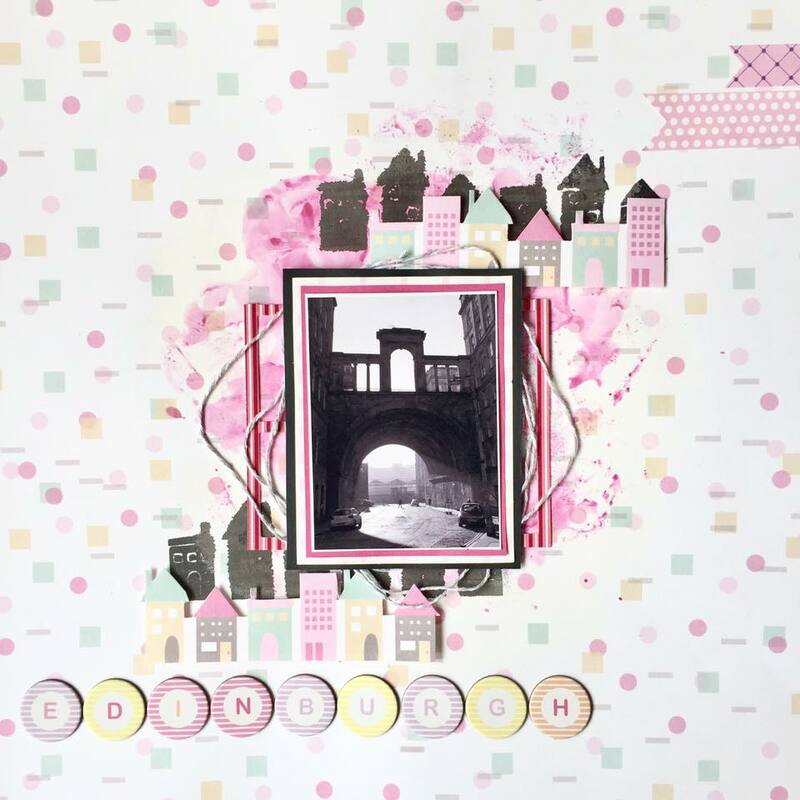 I have a layout to share today using the Wild At Heart collection by Cocoa Vanilla Studio, as well at the Gypsy Gypsy paper pad by Craft Consortium. I chose to use a generic selfie of Nathan and I. I noticed there is a little green in the photo which perfectly matched this butterfly print paper. I wanted to find a new way of using chipboard frames so I cut squares of watercolour print paper and squares of rub ons and then stuck the frames on top. Of course I had to use gesso and the packaging technique on the background too. 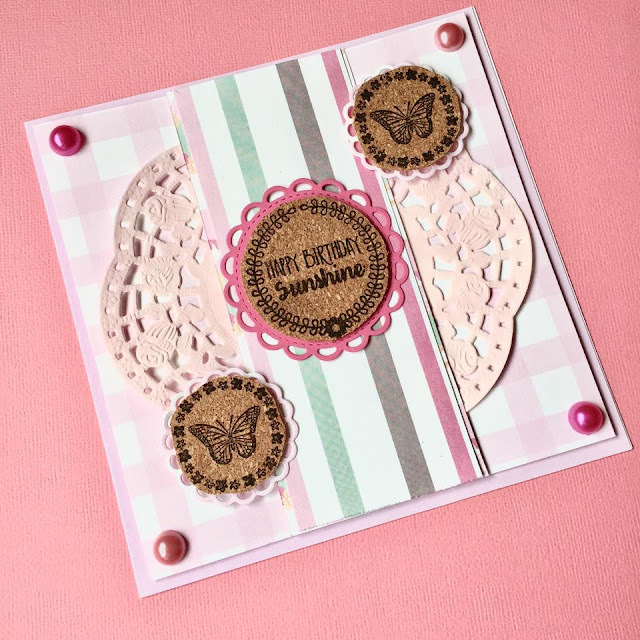 Here are 5 projects using the Simply Creative 'Enchantment' papers from Trimcraft. There are instructions on how to make them below each picture. Cut 2 stars from acetate. Stick together with 3D foam tape around most of the edge. Through the gap, add sequins. Seal the gap. Cut a star the same size from patterned paper and cut an aperture in the middle. Stick on top of the shaker element. Stick to a paper straw. Cut the straw down so the wand will fit on a tall card blank. Take a tall card blank and cover with patterned paper. Place the wand onto the card. At the top and bottom of the straw, cut a slit either side using a craft knife. Thread ribbon through the slits and around the wand and tie in a bow. Embellish the rest of the card. Stamp designs in black ink onto adhesive cork and cut out. Die cut small doilies and stick the cork onto them. Cut a strip from 6x6" patterned paper and mount onto another piece and trim, leaving a thin border. Stick to a 6x6" piece of paper and then onto a card blank. Cut a doily in half and stick on either side of the strip. Stick the cork pieces in a diagonal. Fussy cut houses from patterned paper. Draw around them onto foam and cut out, drawing on the windows. Add a small piece of tape to each foam piece and attach to a stamping block. Stamp patterns along a 12x12" page using the foam shapes in black ink. Fussy cut strips of house and stick below and to one side of the stamped rows using 3D foam. Print your photo at 3x4" and mount. Add twine behind. Cut up some film strips and stick behind the layered photo. Add two pieces of pennant to the top right of the page. Add a title on the bottom right of the page. Use a ruler to rip strips of patterned paper. Stick two strips to a 12x12" page. 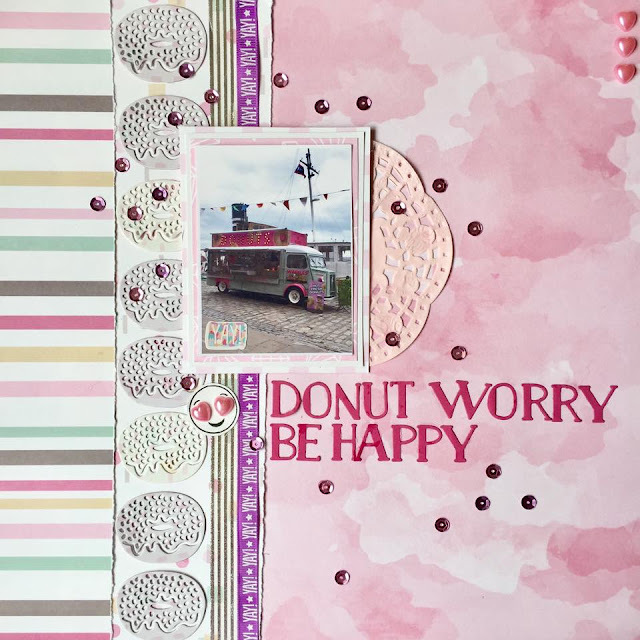 Stick the 6 doughnuts down the page, and add lengths of washi tape and ribbon. Print your photo at 3x4" and mount with patterned paper and a doily. Stick down. Die cut your title and stick down. Finish with an emoji stamp and sequins. Use a doily die with unicorn print paper. Die cut a larger doily and stick the smaller one on top. Stick both onto the top left of a large doily. Add a sentiment too. Stick a die cut tag behind this and add a piece of ribbon through it. Stick to a 14cm square of patterned paper and then stick to a 6x6" card blank. Finish with an accordion flower. I have a layout to share today that's very pink and yellow... a colour combination that seemed odd to start with but I think I made it work! I used a selfie I took with my dad on a little breakfast date we had. On this layout I used a combination of different products rather than lots from the same collection like I normally do. Projects Using... First Edition Grand Plans! 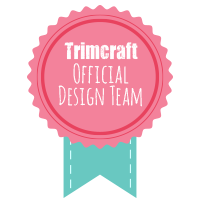 Here are 5 projects using the First Edition 'Grand Plans' papers from Trimcraft. There are instructions on how to make them below each picture. Print your photo and mount several times onto patterned paper. Add some 3D foam to the back. Fussy cut paper planes and arrange around the photo on a 12x12" sheet of kraft cardstock. When you are happy with the arrangement, draw trails from each plane. Make sure you can see the lines. Stick the planes down, along with your photo and other embellishments. Print your photo at 3x4" and stick to a piece of blue cardstock. Die cut a large tag and stick the photo to it, adding a piece of washi tape above it. Add a small piece of twine through the hole in the tag. Cut four 3" squares of patterned paper, distress the edges and add a doodled border to each one. Arrange on an 8x8" page and stick down. 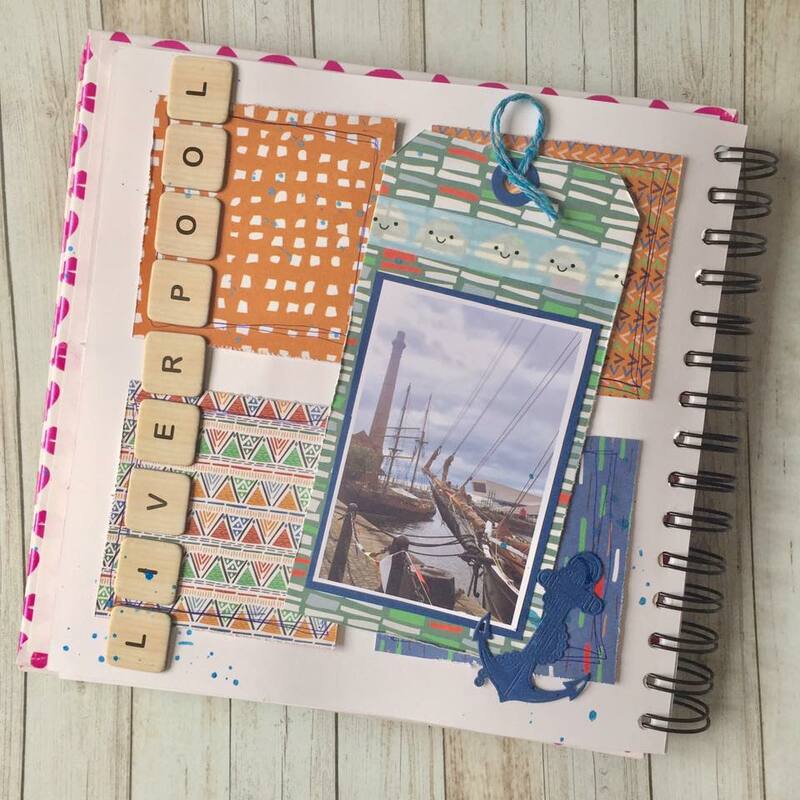 Add the large tag to the page and finish with a die cut shape. Cut a 14x7cm piece of patterned paper and a 13x7cm piece. 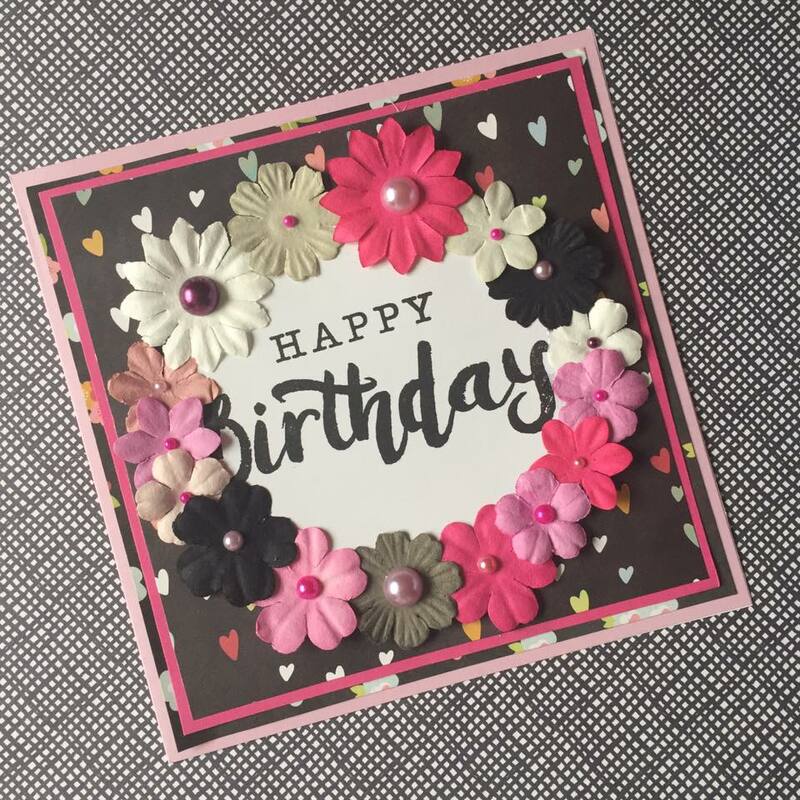 Arrange onto a 6x6" card blank. Cut a strip of blue cardstock and place between the two pieces of paper. Stick everything down. Fussy cut three bottles and stick on the bottom right of the card. Die cut a sentiment from blue cardstock and stick to a die cut doily. Stick to the card. Cut two diagonal pieces from patterned paper by measuring 5cm up one side of a 12x12 piece and 10cm up the other and then join the points together. Cut two strips from blue cardstock and stick under the diagonal pieces. Stick both pieces to a 12x12" sheet of patterned paper. Print your photo at 3x4" and layer. Stick on the page at the same angle as the diagonals. Add the title at the same angle. Journal onto a tag and fold a piece of blue cardstock around it to create a little pocket. Add a piece of ribbon to the tag. Cover the front of the pocket with patterned paper and stick down. May I present my favourite scrapbook layout EVER?! We took these cute selfies in York on my birthday... I chose my three favourites for this page. I used the same filter on all of them so they all had this lovely golden hue. 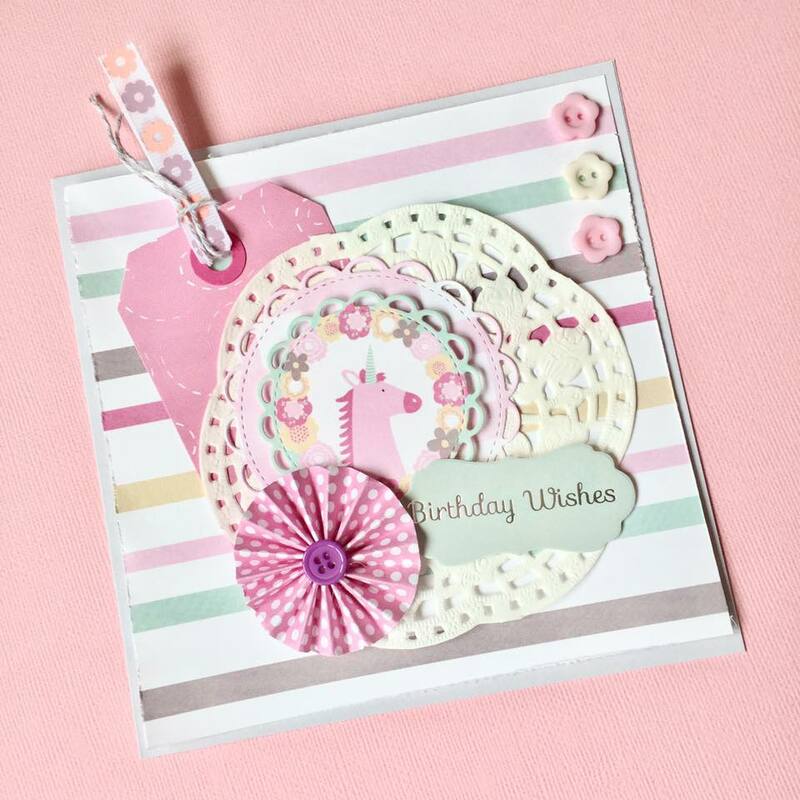 I used the Crate Paper Maggie Holmes 'Carousel' collection for this page.... I loved layering the ephemera together. The backing paper is from the Maggie Holmes 'Shine' paper pad. There's a little bit of mixed media on the background and I made this using gesso and the packaging technique with watercolours. Hands up if you can spy the little Pusheen! Here are 5 projects using the Simply Creative 'Chalk To Me' papers from Trimcraft. There are instructions on how to make them below each picture. Cut a 4" strip of striped paper and stick to the bottom of a dot-print 12x12" paper. Cut a floral border and stick across the join. Cut two rows of garland print paper and stick across the top of the layout. Use 3D Pearl Effects on some of the dots to make them look like lights. Print your photo and mount, add 3D foam to the back and stick down. Fussy cut different elements from the paper pad and stick to the left of the photo. Add sequins and adhesive gems. On a 12x12" sheet of black cardstock, paint white gesso in the centre to the right, and two more areas just above and below. Use coloured chalk with a stencil over the gessoed areas. Using the same chalk, draw a border around the edge of the page. Spray the page lightly with hairspray to set the chalk. Print your photo at 4x4" and mount onto patterned paper and add foam to the back. Fussy cut bunting from patterned paper and stick to the page, adding your photo on top. Add die cut stars and a title. Spatter white ink across the page, making sure you don't get any on the photo. Stamp a large sentiment onto white cardstock. Once the ink is dry, die cut around the sentiment with a large circle die. Arrange paper flowers around the circle and stick down. Add an adhesive pearl to the centre of each flower. Layer coloured cardstock and patterned papers onto a 6x6" card blank. Add the topper to the card. Print your photo at 2x3" and mount onto white cardstock. Cut pieces of coloured cardstock and patterned paper. Stamp designs on the coloured cardstock in black ink and add ribbons too. Add a length of washi tape along the bottom of an 8x8" page. Arrange the pieces on the page and stick down. Finish off with stickers and a date stamp. I have a layout to share today that involves the Mini... but not mine, for once! I mostly used the Shimelle 'Starshine' collection here. The backing paper is one I've been hoarding for a few years, it's by Sei. I got it in a surprise bargain box and it's got a gorgeous green foil on it.